For as long as I can remember I’ve dreamt of visiting Neuschwanstein Castle in Bavaria, Germany, the inspiration for Walt Disney’s Cinderella Castle at Disneyland. 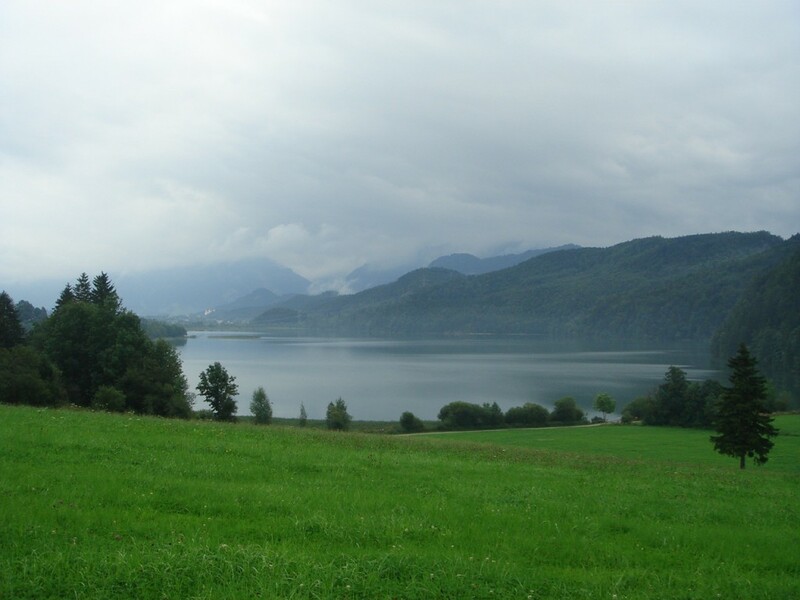 Tomorrow my dream comes true for Neuschwanstein will be our pit stop, but tonight our resting point was Füssen, located only a few miles away from the castle. I had chosen a restaurant (Tannheimer Stube) for the evening which looked somewhat interesting. Its website suggested an Alpine-styled setting, leaving me with visions of Maria bursting into song about the hills, and men in lederhosen yodelling away. “It’s thirty kilometres away, you know” I told my friend. “Is that ok?” “Yeah sure” he said. It was only after I made the reservation at the restaurant that he uttered something about it being in Austria and had I realised? Nope. It had all looked German to me. So today, after having driven some seven hours from Munster, France, to Füssen, Germany, we drove to a restaurant in Tannheim, Austria for dinner. How many people would ever do that? The drive to Tannheimer Stube, a Michelin one-star, made the effort worthwhile. With green hills and lush fields lining the route, it was beset by a mystical, magical quality with the onset of a light mist and the fading of the evening light. We pulled into the restaurant, and it was just as the website suggested, an alpine hut in an alpine setting (where was Maria?). We walked through the entrance into a Laura Ashley-like pastel coloured drawing room and were greeted by Heidi, who directed us to the dining room. Warm and inviting, it was the picture of charm! Pine throughout, there were many touches of homeliness and romance everywhere; the beautiful red rose on the table, the candle shaped lights fitted to the walls, the cushions fashioned with love hearts and similarly matched table runners. 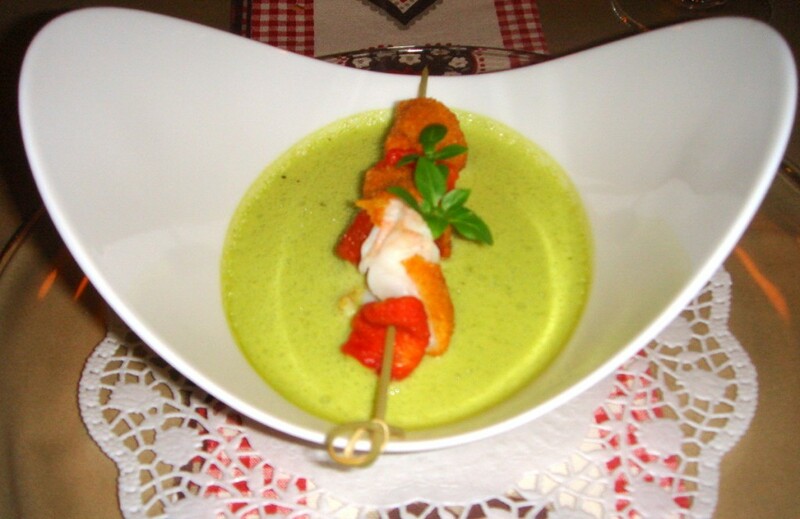 We started with a soup of basil and rocket (€11) which tasted distinctly of each, fresh and crisp but a bit over salted. The accompanying crumbed langoustines and sundried tomatoes on a skewer added a nice textural and presentational twist to the dish, although the skewering made the langoustines a little difficult to eat for one clumsy customer seated nearby. The second starter of lobster (€27) was succulent and firm and melded beautifully with the creamy cauliflower puree; buttery and soft, it dissolved on the tongue. For mains, first a lamb two ways (€32); a roasted saddle with herbs and slow cooked shoulder. The roasted saddle was tender and succulent and cooked pink evenly through, and with the accompanying lamb jus became a meat of refined character. The lamb shoulder, whilst incredibly tender, was a little dry and overpowered by a heavy gravy-like sauce. With the cleverly presented side of vegetables gracing the plate, the finishing piece resembled something akin to a pretty picture. A slow cooked shoulder of beef (€30) was also incredibly tender, but this time wonderfully moist and intensely rich like a deep beef stock. A red wine sauce, powerfully concentrated and with a touch of sweetness, added character and bravado to the dish. The accompanying creamy mashed potato resembled a buttery creamy cloud. Ever so interesting, it was mixed with finely diced savoy cabbage which added bursts of crunch with each mouthful. 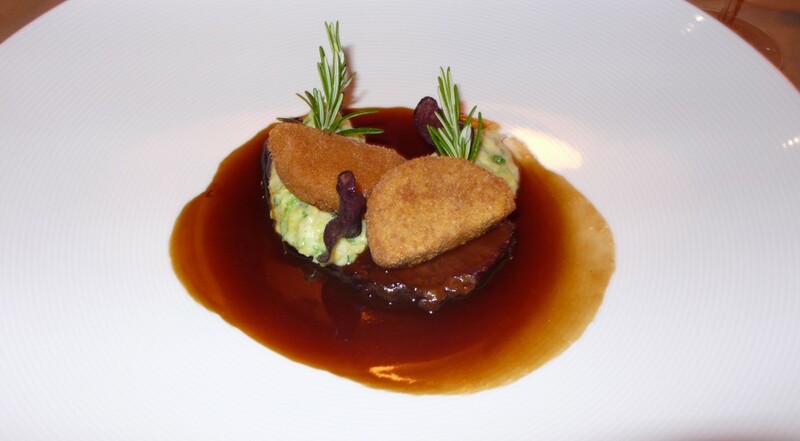 A piece of foie gras coated in breadcrumbs rounded off the dish. Meltingly soft in the middle, the crumbs however detracted from its delicate taste. Ever so full, we skipped dessert but the scrumptious little petit fours at the end of the meal filled this avoid and again served to demonstrate the accomplished touch of the restaurant. The solid cooking aside, the charm of the restaurant was probably what draws the crowds. Our service had been hospitality at its finest. We were left wanting for nothing, our every whim catered for; from the ample breadbasket, to the constant filling of our glasses through to the congeniality of our hostess. The room itself was the epitome of homeliness. Warm and relaxed, it was the type of place to spend with family and friends; a place to drink glühwein, and snuggle up with a loved one after a long, hard day of skiing. There is a word in German probably most appropriate to describing the ambience of Tannheimer Stube. It is gemütlich. The closest English translation of this word is cosiness. I conceive other website proprietors should take this website as an model, very clean and wonderful user pleasant design .